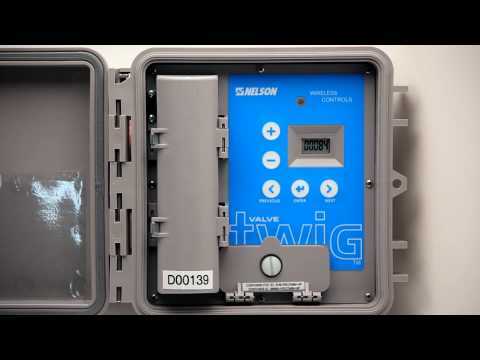 The TWIG (shown on a 800 Series Control Valve) is central to the wireless system. This device turns low voltage DC latching solenoids on and off at the command of the TD200 Controller. Proprietary “Nelson” high powered radio. Adjustable between 902 and 924 MHz. TWIG-2. Operates two solenoids, independently. TWIG-4. Operates up to 4 solenoids, independently. Power source: Two D-cell batteries, good for one irrigation season — shipped with TWIG. Utilizes a proprietary “deep sleep” cycle technique to minimize power consumption. Dua l internal antennas (standard). Provides diversity for better reception, and protection from damage. Use where line of site is optimal. External antenna (optional). Use to improve signal reception when TWIG does not have good line-of-sight, and to extend range of communication. The TWIG is packaged in a rugged, field ready water resistant box. Ag tough! Joining a TWIG to a network is effortless and quick, either on setup of a new system, or the addition of a new TWIG to an existing network. TWIG is capable of running a manual solenoid test to check solenoid. Each TWIG has a factory assigned ID #. Plastic mount for the 1000 Series Tee and Elbow valves (11950). Comes with the two Silicone filled wire nuts for solenoid connections.